Global M&A activity has been one of the most notable stories of recent years. Dealmaking activity climbed sharply in 2015, rising to $4.7 trillion, up 42 percent on 2014. Companies have engaged in deals in new and complex markets, lured by the promise of reduced costs and value creation opportunities. However, dealmaking today is rife with risk. 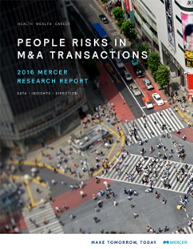 A new report from Mercer, ‘People Risks in M&A Transactions’, looks at one of the most potent areas of risk: individuals often fail to adapt to organisational transition brought about by M&A, and this can create turmoil. If left unchecked, the inability of individuals to manage uncertainty and embrace change brought about by deal making can have a profoundly negative impact on an organisation. Issues such as employee retention, cultural integration, leadership assessment, compensation, benefit levels and overall talent management are significant. Fifty-five percent of buyers surveyed by Mercer said that employee challenges continue to present significant risks in M&A deals. Companies are completing deals in a highly competitive and demanding economic landscape. Increased competition and the influence of activist shareholders, for example, are combining to greatly curtail the length of time in which companies can carry out their due diligence procedures. They are under pressure to get deals done quickly. Forty-one percent of acquiring companies claimed they have less time to complete due diligence compared to three years ago. Furthermore, 33 percent of acquirers believe sellers are providing less information about assets for sale. “Both buyers and sellers tell us they need rich data, unique insights and practical guidance to maximise transaction value and reduce people-related risks. The goal of our research is to enable business leaders, inside and outside of the HR function, to make more informed people decisions in the current challenging global deal environment," said Jeff Cox, Mercer’s global M&A transaction services leader. According to Mercer, companies should invest in their employees with the same enthusiasm they have for managing their balance sheet and other investments. By focusing on staff, companies can minimise disruption and increase value in people related areas.